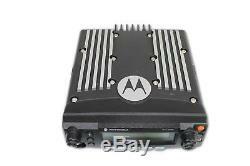 Motorola XTL2500 P25 Digital 30 Watt 900 Mhz Radio, Head & Power Cable ONLY HAM. 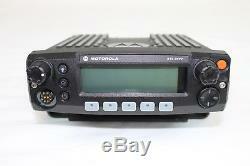 Motorola XTL2500 900 Mhz radio - model number M21WRSPW1AN (Radio with head and power cable ONLY - Other accessories NOT included). This is a 30 Watt, 870 channel radio with a band split of 896-941 Mhz. Firmware = 19.50 DSP = 19.00.00. Radio is in great condition and comes with power cable. If using this unit for HAM band operation this will require a modified code plug. We can provide the contact information for the HAM group that can provide this modification for you. Options Installed on this Flashcode. G806: ASTRO IMBE Digital Operation G114: Enhanced Digital ID Display G683: Trunked One Touch Status Message G51: SmartZone Systems Operation. We will only program up to 16 channels and do not program for trunking systems. The item "Motorola XTL2500 P25 Digital 30 Watt 900 Mhz Radio, Head & Power Cable ONLY HAM" is in sale since Thursday, May 31, 2018. This item is in the category "Business & Industrial\Facility Maintenance & Safety\Surveillance & Alarm Equipment\Two-Way Radios". The seller is "erac1" and is located in Lakewood, Colorado.